Less than 24 hours after signings his 3yr/$39M ($30M guaranteed) contract extension late last Saturday evening, RB David Johnson was underutilized by his new coaching staff as he received a mere 14 touches for 67 total yards and a rushing TD. After receiving five touches on the opening drive, they chose to go away from DJ as the fell out to a 21-point 2nd-Quarter deficit. He certainly wasn’t the only Cardinal to underwhelm during Sunday’s 24-6 snoozefest of a loss at home to open the 2018 campaign against the Washington Redskins. In fact, the 14 first downs and 213 yards compiled by the Cardinals offense last Sunday was the lowest amount in each category since the 2014 Wild Card game in Carolina, when they posted only eight first downs and 78 total yards. The Ryan Lindley game. On top of that, the Cardinals ran less plays in the first half than Washington had points (21; Cards ran 14 plays including a kneel), as Sam Bradford went 3 for 7 for 11 yards during that first half of play. As the offense turned one-dimensional in the second half, Sam went 17 for 27 for 142 yards with 0 TDs and 1 INT in the third and fourth quarters. Cardinal wide receivers caught 8 passes for 80 yards. 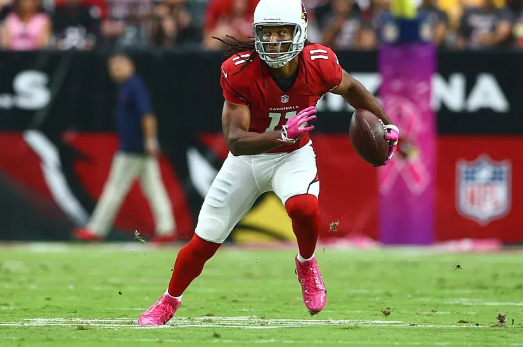 Larry Fitzgerald caught 7 of those for 76 yards. Rookie Christian Kirk caught the other pass. J.J. Nelson, Arizona’s only real deep threat, played only one snap in the embarrassing loss. Even though he’s known more for his feet than hands, the Cardinals need J.J. out there to help open up passing lanes that otherwise wouldn’t be there. With his elite level speed, even if just acting as a decoy, Nelson being on the field would help keep the Rams secondary honest and give the Cardinals intermediate passing game more of a chance to be successful than it was against Washington. This week’s opponent, the Los Angeles Rams, sport two cornerbacks, Aqib Talib (5X Pro-Bowler from 2013-’17) and 4th-year vet, Marcus Peters (2X Pro-Bowler in his first 3 seasons), that will in all likelihood make life miserable for Cardinal receivers for a second consecutive week. 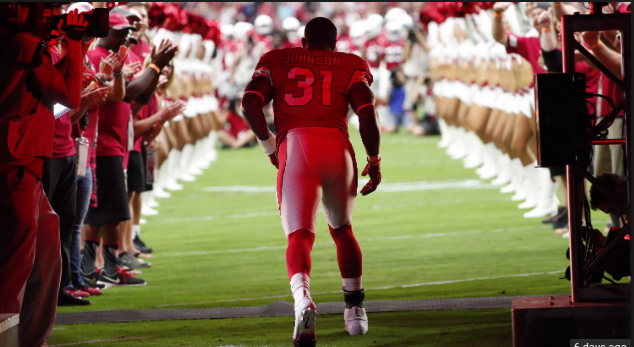 With that being said, it’s going to be vital to get David Johnson running downhill from the start in hopes of opening up the air attack as the game progresses. Last week, Talib & Peters held WR’s Jordy Nelson & Amari Cooper of the Raiders to 4 catches on 32 yards combined. Peters also had one of the Rams’ three interceptions on the day. The L.A. Times’ Sam Farmer was on Arizona Sports 98.7 F.M. earlier this week and said he believes the Rams biggest weakness is probably their linebacker group. That was evident by the nine catches apiece that TE Jared Cook (180 yards) and RB Jalen Richardson (55 yards) had during Week-1 (both positions typically guarded by linebackers). The Cardinals will most certainly try and follow the blueprint laid out by the Raiders on how to move the ball against such a stout defense, that not only has Peters & Talib, but also the reigning Defensive Player of the Year, Defensive Tackle Aaron Donald. Donald was mostly contained last Sunday as he finished with just one tackle to his name. Ndamukong Suh, who the Rams acquired this off-season, finished his first game with the team that drafted, now Cardinal, QB Sam Bradford first overall and one spot ahead of him in the 2010 draft. On that note, it’s going to be imperative that the tight ends make an impact against the Rams. 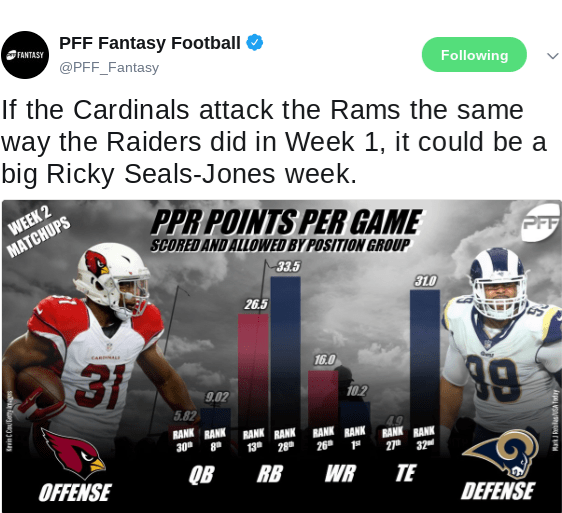 If Jermaine Gresham (Achilles) can’t go, Ricky Seals-Jones will be asked to shoulder the workload for a second straight week. RSJ finished last week with 18 yards on three receptions. Seals-Jones also failed to haul in a touchdown late in the game. Last season, the second-year tight end averaged over 16 yards per catch. While that number is probably unrealistic, the Cardinals need him and Bradford to combine for better than 6 yards a completion to help open the field up for Larry & David this afternoon. Of the 11 victories with Johnson starting in the backfield, only twice did the Cardinals feed him less than the 28.6% that he received in last week’s loss. In victories, DJ receives over 36% of touches, while he’s closer to 33% in losses – not much of a difference but the Cards will want to be over 35% more times than not, especially in this offense with the lack of starpower in the skill players. With an offense in a state of flux while still learning a new system, to go along with an exceptionally unproven receivers room – of the 1,319 combined receptions from the five WRs, 1,315 have come from Fitzgerald (1,241) and Nelson (74) – offensive coordinator Mike McCoy and Sam Bradford need to find a way to get their most potent playmaker, David Johnson, much more than 14 touches – or 28.6% of the plays – he received in the season opener. Look for the Cards to try and get as close to that 30 touch magic number for DJ today – even though he worked through a minor back injury this week – as they look to pull off the biggest upset of the NFL weekend in LA (worst odds of the week in Vegas; 23% chance of winning).